Please Celebrate Locally Aug20-28 the 22nd Birthday of Miracle, the first white buffalo calf born in apparent fulfillment of the Lakota prophecy of hope for these times predicted nineteen generations ago. 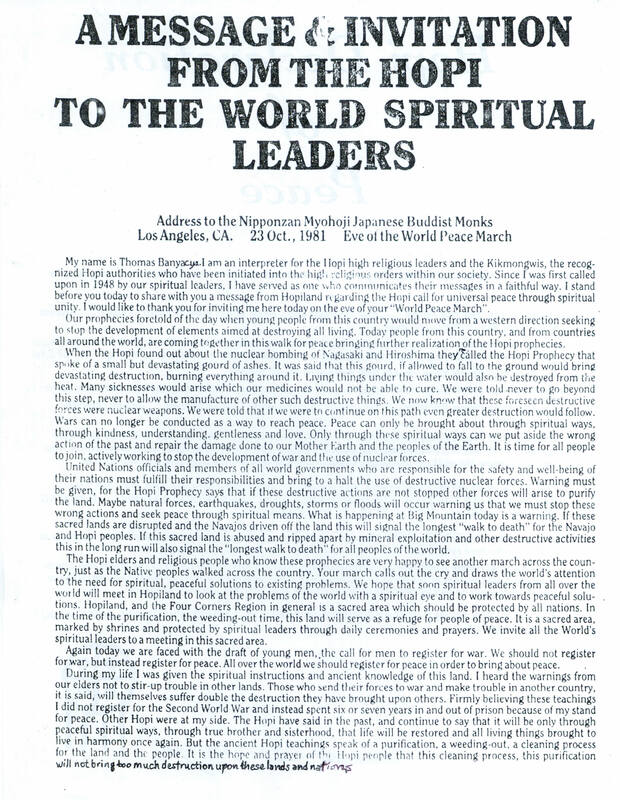 There is a public facebook group for you to post announcements of your plans and reports, create FB Events, etc, about your locally scheduled Aug20-28 Legion of Lights Spiritual Unity Celebrations of the fulfillment of the Lakota Prophecy of Hope for these times predicted nineteen generations ago. This happened with the birth of the first white buffalo calf, named Miracle, on August 20, 1994, 22 years ago. Reports from one of these 22nd Miracle Birthday events, a related conference at the Hopi Cultural Center conference room, will share its results online so others anywhere can share in what happens there, as well as looking for uplinked video from many locations throughout The Continent of America. It would be wonderful if you can create and host your own local American Spiritual Unity Gathering in support of the prayers from one of them which is being convened in the conference room at the Hopi Cultural Center, whose results will be quickly posted to the Internet day by day for global viewing including at such local support gatherings anywhere. These Spiritual Unity Celebration Gatherings are inspired by the precedent mutual prophecy fulfillment gathering planned over three years and held August 20-28, 1994, near the Grand Canyon after a few days at Big Mountain, under auspices of the World Unity Festival and Drums Around the World, during which on August 20, 1994, was born the first white buffalo calf, named Miracle, in apparent fulfillment of the Lakota Prophecy of Hope for these times left nineteen generations ago by the White Buffalo Calf Pipe Woman with the teachings of the Sacred Pipe (Chanupa) of the Lakota, Dakota and Nakota peoples. The main ceremony on August 28, 1994, was a Chanupa Ceremony conducted by Chief Phil Lane Jr of http://fwii.net with thousands of people gathered around the Peace Pole for the White House after introducing to the ceremony area the preceding day the Peace Pole for Jerusalem. There is a 2hr video now on YouTube about the Rainbow Uprising Initiation events in 1990, , under "Rainbow Uprising Campaign - Keepers of the Flame" which is an example of what we hope to do live over the internet and recorded also via ustream.tv for this August 20-28, 2016, Legion of Light mutual prophecy fulfillment gathering. The Rainbow Uprising of Consciousness Campaign - Santa Barbara Initiation Events over a week in January 1990, featuring welcoming by Chumash medicine practitioner Choy Slo and Bear Clan Grandmother Pilulah Khus, Tree of Peace and Great Law of Peace teachings by Mohawk Chief Jake Swamp, Hopi Prophecy discussions by traditional Hopi interpreter Thomas Banyacya (author of The Hopi Declaration of Peace), Nipponzan Myohoji Japanese Buddhist Monks lead by Rev Yoshida Shionin with Masao Nippashi on opening drum, interview about Tibetan prophecy with Kenpo Karthar Rinpoche the abbot of the Kagyu Order's Karma Triyana Dharmachakra (KTD) Monastery in Woodstock NY, Zen Buddhist Monk and initiator of the 1995 Global Peace Walk project Rev. Yusen Yamato, a panel discussion including community leaders Gene Knudsen-Hoffman of the Fellowship of Reconciliation, Laura Lynch then with the Nuclear Age Peace Foundation and now a prominent anti-nuclear activist, Mark McGinnes of UCSB Environmental Studies Department and local SB Environmental Defense Center, scientist Bruce DePalma inventor of the n-Machine "free energy generator" proven in principle in Santa Barbara in 1979 under sponsorship of the Sunburst Community, with Hiroshima A-Bomb survivor Kaz Suyeshi who installed the Hiroshima Peace Flame on the UCSB eternal flame monument, Manzanar California WWII Japanese Concentration Camp survivor Judy Imai of the Global Walk for a Livable world which carried the Hiroshima Peace Flame after this event across the US from California to the United Nations, events organized and video narrated and produced by David Crockett Williams, filmed by Todd Swan of PAN Productions. Video 2hrs including actor Jon Voight last 30 min talking at UCSB peace flame discussing Hopi Prophecy about the House of Mica, filling in for his friend Thomas Banyacya who had to leave early to go to the second Global Forum, in USSR, with satellite linked video of that also included.